artwork | I am Chubby Bunny! On March 31, Natalia Fabia‘s group curated show “Hookers,” presented at the Corey Helford Gallery celebrated their opening night! Natalia is an awesome lady, and amazing oil painter that I met at a party many moons ago, and she asked myself and Yume to pose for one of her paintings <3. The theme for this night’s exhibition was “Hookers,” a word that Natalia always uses to describe women who are strong, independent, and stylish, using it in a positive sense to convey modern feminine beauty. The show featured 22 artists’ rendition of “Hookers,” and the opening night was jammed packed with awesome art and colorful people! The hordes of people visiting opening night. Outfit shot from the night! Click on the photo to "Hype" my coord on Lookbook! AUGUST 26 — On a summery evening in the outdoor courtyard of Sancho Gallery in Echo Park, friends, family, and supporters of the arts gathered to help raise money for the James Philip Ribiat-Finley Arts Endowment . Organized by Stephanie Inagaki, designer of Miyu Decay, the Endowment was started in memory of James Philip Ribiat-Finley, her late fiance. The endowment is used to support local teens who are interested in a career in the arts. Stephanie asked many of her friends for donations and help with promotion and production of this event, and ended up with a wonderful turnout. I donated several Chubby Bunny items to be used in the raffle, as well as helping with setting up the space earlier that afternoon. The event had performances, art for sale, a silent auction, and an epic raffle! This man actually mentioned to me before the raffle that he really wanted to win the Hello Kitty bow! AND THEN HE DID. Crazyyyy! Stephanie (center) announces raffle prize winners. The piece being held is from Michelle Romo! The winner of one of my bunny ear hair accessories! There was a really good turnout and it was so nice to see so many people supporting a worthy cause! Congrats to Stephanie and all of those who supported this event! More photos of the event are on my Flickr! Japan Day 6: Osaka nostalgia and Eimi’s Art Show! The next day I was pretty sleepy and groggy, but managed to human-up and get out to lunch with Caro to meet up with Nico and Chikuwaemil! They are both fantastic artists, and such nice people. It was Caro and my first time meeting them in person, though we had worked together before on a few projects for about half a year or so. They both live in rather far out places of Osaka, and were so nice to come into central Osaka to come and meet us! We went down to eat at the Dig Me Out Cafe, which was right below our cafe, and also the venue where the art exhibition we were in town for was set up! Eimi was the main artist for this show, but she had just finished hanging that morning and ran off to a meeting so she wasn’t able to join us for lunch. Emi’s exhibition was already hung by the time we got to the cafe for lunch so we looked around and signed her guestbook! Someone had gotten Emi this really cute panda bouquet! We walked around Shinsaibashi a bit and looked at some stores before Nico had to leave to get some work done. Chikuwaemil and Caro stayed together and shopped some more, but I took a mini siesta back at the hotel because I wasn’t feeling so hot. When I awoke from my mini-nap, Caro and Chikuwa were in the middle of something, so I just took a quick walk around the Shinsaibashi and Namba area to visit all of my old stomping grounds quickly. A view from the famous Doutonbori bridge. TONS of signs light up the sky at night. Thank god it was a nice cool and overcast day for once so I didn't die of heat exhaustion. This is the spot where I used to hang out with my current boyfriend and drink beers and eat a hot meat bun while talking about stuff late into the night. Ahhh, romance. Another view of the signs next to the Dotonbori river. Left to right: Eimi, Miho (one of Chikuwa's artist friends), and Chikuwaemil! 2 visitors to the gallery. I loved this girl's little pink horns and the eyeballs on her sailor jacket! My friends that I was hanging out with the night before showed up too, and we all chatted and made new friends throughout the night and talked art. I took a ton more photos, which you can see here! Around 10:30 or so we were super tuckered out, so Caro and I headed back to our hotel room to sleep forever and ever, and pack up to head back to Tokyo again the next day! (whirlwind trip, no?) We had a fashion show to attend back in Tokyo the following day, so our stay in Osaka was very short (though I came back for epic adventures once that was done). In the morning Eimi was nice enough to meet us for a quick breakfast before we hopped on the bullet train back. Eimi was SO CUTE and drew us both pictures! You can see her on the left flipping through one of her books and the adooorable sketch here! After that we said our goodbyes and got on our train heading back northeast! The art show was really fun and I’m glad we were able to schlep down for one day to see it! The girl says "I'm helping my mom with chores!" in the first box. Then in the second box.. uhh... sheep. You can see the rest of the photos I didn’t post on my blog here! Be back tomorrow for an EXTREEEME update on the HARAJUKU KAWAII!! fashion show hosted by ASOBISYSTEM and some BEARBRICKS info about their massive display up in the PARCO department store in Shibuya! How many parties + openings can you cram into 1 day? Answer: FOUR! (FIVE if you count after party ramen). As long as you only eat 1 meal, that is. Our first full day in Tokyo (Sunday, July 24, 2011) was CRAZY PACKED as every event EVER was happening the same day! We put on our fancy shoes (and I packed comfy ones for the unavoidable max-pain-time), fun outfits, and braved the ridiculous heat to see our friends at their events. Caro & I started the day by attending an art show/workshop hosted by Reiko Tada, who is also known as the drummer for the kickass Japanese band Kiiiiiii! The exhibition was in a cute little gallery above a store in Kichijoji. Reiko’s style is super cheerful, playful, and childlike, but with weird little details that you only notice if you look closely! Right up my alley, haha. Mural done by Reiko and a crowd of people waiting for the workshop portion to start. Reiko (left in black and purple tshirt) begins the workshop. These mini artbooks were adorable! "In the KIIIIIIIIII of Life" is a short newsletter Reiko does for her fans about random events she's been to, or things she's thinking about. We only stayed for about an hour, and then jetted off to the next location, which was 1) cramming some pastries that Caro got as a present into our mouths while standing on the train platform because we forgot to eat and 2) popping by the 6%DOKIDOKI store in Harajuku to say hi to our friends! I don’t have any good photos from this visit, since it was literally 30 minutes or less that we were there, and we were all soaked in sweat by that point, haha. Oh, Japan summer! It was really nice to see Vani and Yuka, though we had JUST missed Sebastian and Mika since they were taking a much-needed lunch break. This was just one of many times we would see the 6%Dokidoki gang, so we gussied up, said goodbye and headed to Shibuya to attend FILMMAKERS!!! Vol 02 at SECO Bar in Shibuya. Me: So, they SHOW VIDEOS like on MTV? Like a DJ but with videos? Tavuchi: Uhmm.. yes! they make videos! Me: Wait, they MAKE them or they SHOW them? Tavuchi: They show them! And they make them! English fail on my part, basically, ahaha! Anyway, on to pics from the event! Spank! and Shojono Tomo were making collaborative items! You picked artwork from Tomo, and Tavuchi made it into a cute accessory! Such a good collab! Here is Tavuchi, Spank! 's owner, making a bow right at the table. Shojono Tomo's half of the booth. She puts her artwork on clothing, bags, handkerchiefs, and tights! I ended up getting a pair ❤ Gotta support our artists! Shojono Tomo and Tavuchi! They are awesome ladies and have been friends for a long time. Tavuchi even sells Shojono Tomo's items in her Spank! stores! Me and Caro pose with our custom made giant heart pins! I love these! Features Shojono Tomo's art, and Tavuchi's amazing DIY skills. She made these in like 2 minutes! A customized medical mask made by Shojono Tomo.So badass!! Tavuchi even made me an adorable bow as a present! Here is a pic of the back of my head (which apparenly is already up on Tumblr and has a hundred notes on it, haha), and my messy hair, but the bow is SO adorable! So excited to see Eimi again (left)! Her and her friend came to LA before for the Magical Girls' show in April this year, and it was nice to see them again! After about an hour and a half there, we rushed off again (I think it’s about 7pm at this point? ), this time with Tavuchi leading the way so that we could meet her friends at the Koenzine Launch party in Koenji. I could literally write a BOOK about the things I experienced in Koenji this night and the other few days I stayed there with Tavuchi later on in my trip. Instead, I’ll try to give you the short fun version, and save my deeper thoughts for a separate post another day, haha. Koenji is a town just to the west of Shinjuko on the Chuo line. It’s credited as being the town where punk rock music was introduced to Japan, and is full of hundreds of little vintage stores, many of which not only sell straight up Western vintage, but also do amazing DIY remakes of clothing. There are many original clothing brands there, and the feeling is youthful, fun, and sort of vintage in itself. I felt like I wasn’t really in Tokyo anymore when I was here, it was so quaint and bustling with youth and really nice, open people, and it was really lovely. Koenzine is a “zine” in the traditional sense, a print magazine created to show the spirit and artistic life in Koenji. With photography by Hanayo, the book showed many faces I was already familiar with (Tavuchi, Mlle. Yulia, Toko, etc). The Koenzine party was held in the Kitakore building, which is a massive building that is so old it looks like it’s falling apart, with makeshift floors built in as new brands want to open in there. Here you can find brands such as DOG, which Lady Gaga’s stylist basically pulled ALL of her clothes from and created her image from is housed there, along with Giza, ilil, and a load of other stores I know I am forgetting, plus a small exhibition space in a makeshift “floor” in the corner of the building. The photos really tell all! So on to photos! The ceilings are approximately THIS high! It's like eating the pill that makes you bigger in Alice and then going shopping! SUCH a cool building! And you can see Tavuchi's face down there, too :)Just some of the amazing DIY merch on sale in the Kitakore building! Here is part of the exhibition they created in honor of the Koenzine launch. These items are discarded pieces from the stores in the kitakore building. You can see the old "Garter" sign laying in there, too hehe. Small snapshot versions of the photos that are in Koenzine were tacked to the walls in the exhibit area. Here is Tavuchi posing next to the photo of her that appeared in the 'zine. Here is a beautiful pic of Mlle. Yulia that appears in Koenzine. Yulia's handmade jewelry line, called Giza, is sold exclusively at Garter and features impressive metalworking, which Yulia says she picked up when she was living in London for a few years. Yulia (right) and Koshiro (left) DJ a set together. Koshiro is the owner of Garter, and also Yulia's beau ❤ this photo of them is ADORABLE. The awesome dude on the far right is Youhei, who you will hear more about later. He's awesome and another SOUL MATE of mine haha. The new hotness. From left to right, Lotta (who wasn't able to come to LA, so this was our first time meeting her, Alice, and Tiffany! Group photo! the projection screen sorta killed this, sorry! Left to Right: Tiffany, myself, Caro, Alice, and Lotta. My soul mate found me again! Ken was at the event too and we had a few beers, like soul sock bruthas do haha. He is really such a fun dude! And check out his badass chain! It's plush, and part of his "Broken Doll" line that he sells at his store in Shimokitazawa. The lovely ladies pose for another photo. So artsy! No late night party time is complete without some FOOD! If you’ll recall, Caro and I only ate ONE OTHER TIME today, and those were just pastries about uhmm… 10 hours before this. So we headed over with our friends to a ramen place nearby and ATE UP! Alice was SO CUTE and I got to meet her boyfriend and friends who came along with us to eat! SORT OF A LONG STORY, but Alice was pointing to two guys and said "That's my boyfriend!" I didn't know which one so I said, "The one who looks like Luffy from One Piece or the other one?" It was the other one. This is the other guy. He's awesome and one of Alice's friends hehe. 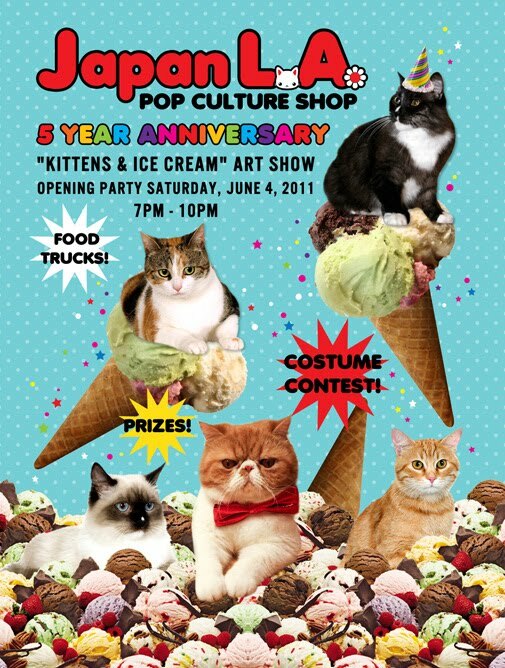 Last Saturday, on June 11, 2011, I checked out two exhibition openings with a ton of talent around Los Angeles. First, I headed to Corey Helford Gallery in Culver City, to see the opening for Nouar’s “Internally Yours” show. This was Nouar’s first show at Corey Helford. The show featured 3D gelatin molds with sinister faces eating themselves, other people, and each other. A little creepy, but overall cute, it was a really fun show to take in. Nouar’s show will be up until June 29th, so get over to CHG asap! They are also showing Joshua Petker’s “Celluloid Constellations” upstairs. Kittens & Ice Cream Artwork: ネコポリタン (Nekopolitan)! 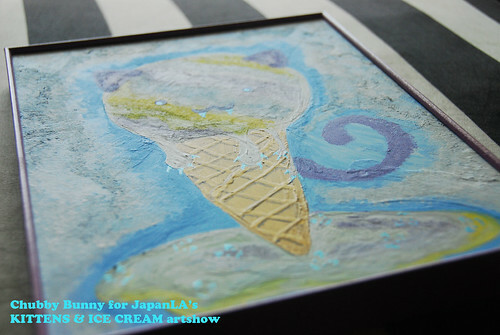 I will be participating in JapanLA’s “Kittens & Ice Cream’ art exhibition, which opens June 4th! I just finished photographing the art piece that I’ll be entering in the gallery! 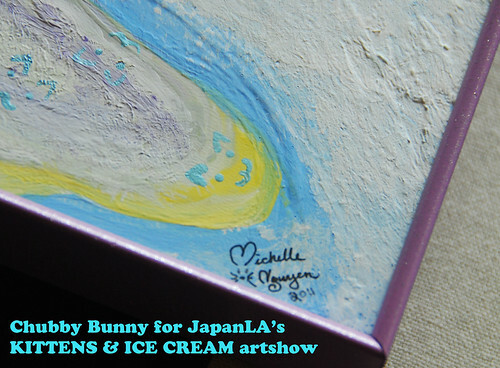 A portion of the sales will go to the Japan Earthquake Animal Rescue & Support. 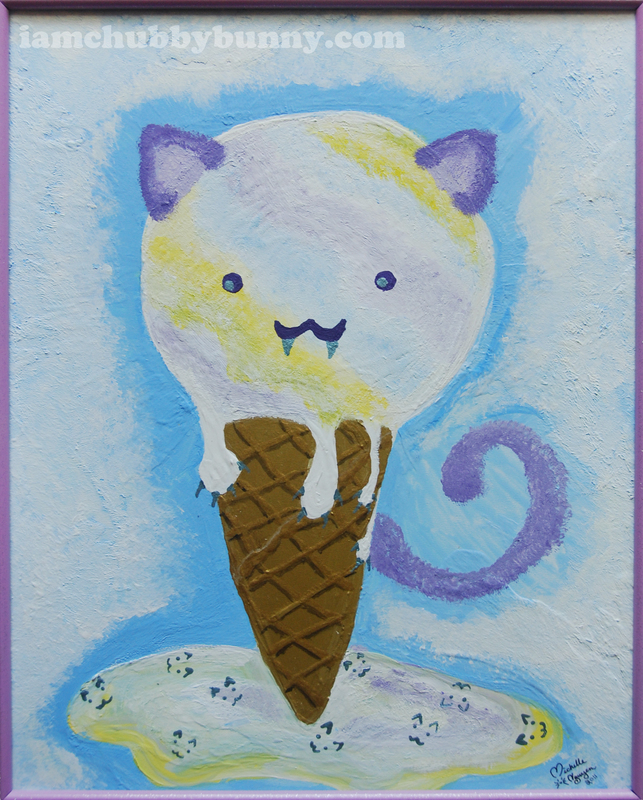 I used gouache, which I love for its texture, and some acrylic to get the pearly looking accents just right 🙂 At first, I had just the cat face on the ice cream cone, but added fangs and creepy claws to it to give it more character and weirdness, haha. The little faces in the melted puddle creep me out…! Hope you guys like it! If you have any questions about it, or are interested in purchasing, let me know at iamchubbybunny@gmail.com! 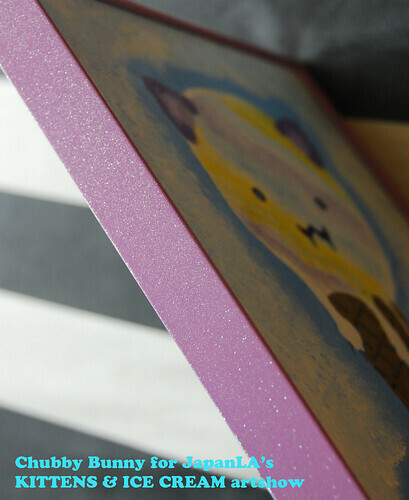 I had fun DIY-ing the simple frame by making it lavender and adding silver glitter. Signing my real name on artwork, and not as "Chubby Bunny" 🙂 Shock! 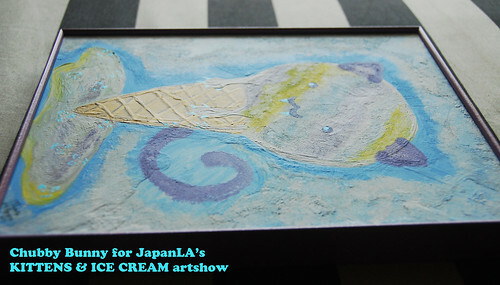 If you’d like to see the work in person, it will be on display in JapanLA from June 4 throughout the month! Also, if you’re local to LA, you can come to the big opening party! (Hosted by my event production company Bubble Punch!) Hope to see you there! Epic flyer by Michelle Romo! “Bunnies & Bows” Opening Video! Hey everyone! My awesome friends over at One Bus Productions have finished editing the video and interviews taken at the “Bunnies & Bows” opening on May 7th! **Chubby Bunny accessories that were available at this show are now available online here! ** ARTWORK FROM THIS SHOW IS STILL AVAILABLE FOR SALE! Check here! Thanks again to everyone who supported me to make this event truly amazing!